The 22nd of November 2005 was the day Cat’s Eye Carving was officially started. I had a small workshop space that I had been renting at Harts Barn in Longhope since March of that year but I finally decided to take the plunge just a few months later. I had been working for a commercial company nr Stroud for the previous 18mths but felt that I wasn’t able to utilise my creativity enough. 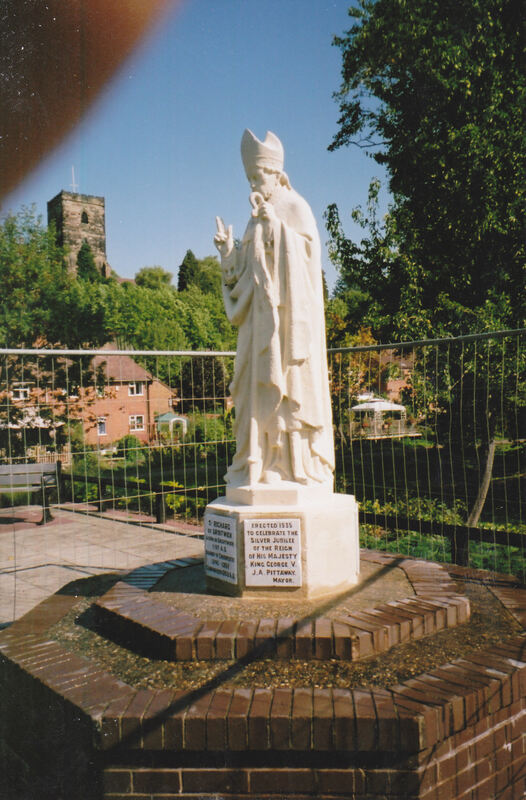 I had developed Osteo-Arthritis in my fingers and thumb of my left hand following an injury I sustained as an apprentice so by running my own business I could manage that and stretch my artistic side-after all sculpture was what I had been studying at school and university. Obviously I had to be realistic and so got myself a job at my local-the old Brunswick pub in Gloucester. I remained working here two days a week and spent 4 days a week at my workshop. 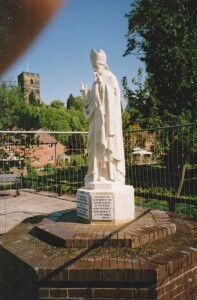 In March 2007 I was asked to repair and restore the statue of St Richard of Droitwich in Vines Park. This was the first time I could really use everything that I had learnt over the previous 8yrs. In 2007 I again moved into a slightly larger workshop and was able to give up my job in the pub and concentrate fully on my business, I carved a simple font for Withywood Church in Bristol, Heraldry for Penhow Castle in South Wales among many other house names and numbers. The festival attracted a variety of stonemasons four came over from Canada which was really exciting, we managed to raise about £4000 for the chosen charities. I repeated my festival in 2009 and we still managed to raise a reasonable sum even though the recession was beginning to bite. 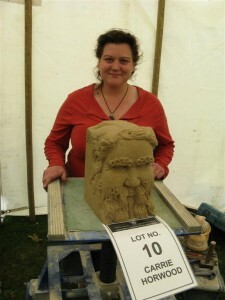 I also attended a stonemasons festival in Norway, my carving of Freya raised a whopping £1200 for the Cathedrals fund. I also took part in the York Minster stonemasons festival that year and carved a nautilus shell. But after a difficult year and no real development on the site I decided to move again, this time to Taurus Crafts Nr Lydney. I arrived just in time for the February half term (2011) and spent the following three months running my business from a small marquee! My first display carving was Cecil the boar click to see the carving. 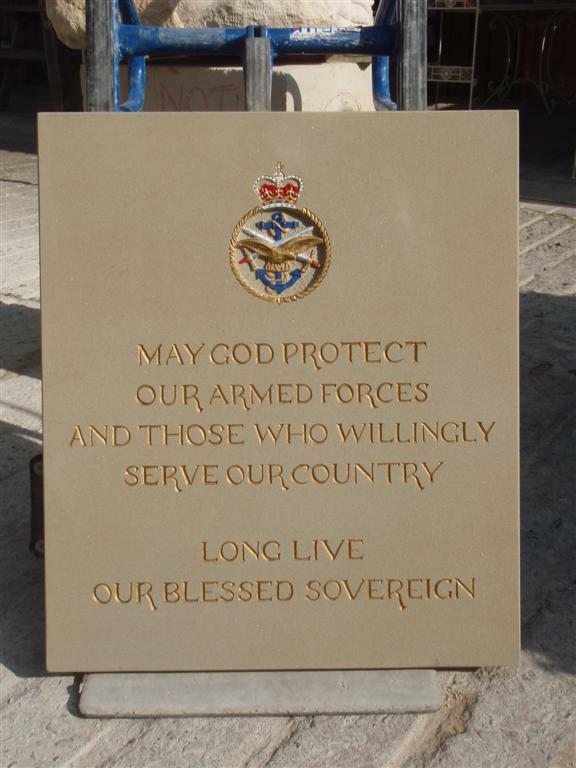 I was also honoured to carve a memorial to the armed forces which is located outside Pershore Abbey. In May 2011 I moved into a larger workshop, it had walls and a door-I was in heaven!! Just 3mths later a smaller workshop became available which was more suitable and I was able to continue with working on an interesting variety of commissions including 3 grotesques to be built into a local house 2 large acorns as a memorial in a large and beautiful garden. This is when I finally got to carve the cherubs for the Scotland memorial. 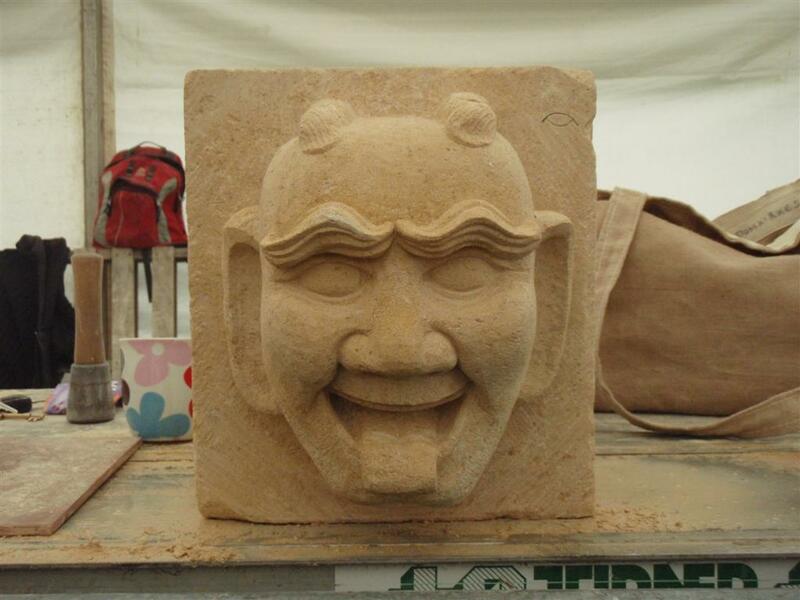 I took part in the Ludlow festival again and this time my carving was awarded both prizes and I was able to use the prize vouchers to invest in a piece of equipment for my workshop which takes some of the strain out of carving the Forest of Dean Sandstone. I had been putting together a festival of my own quietly in the background and in May 2013 I ran the Gloucester Stonecarving festival at The Llanthony Secunda Priory in Gloucester. the carving took place over 2 and a half days and raised money for The Gloucester Geology Trust and The Priory itself, the auction raised just over £2500 for the two charities. 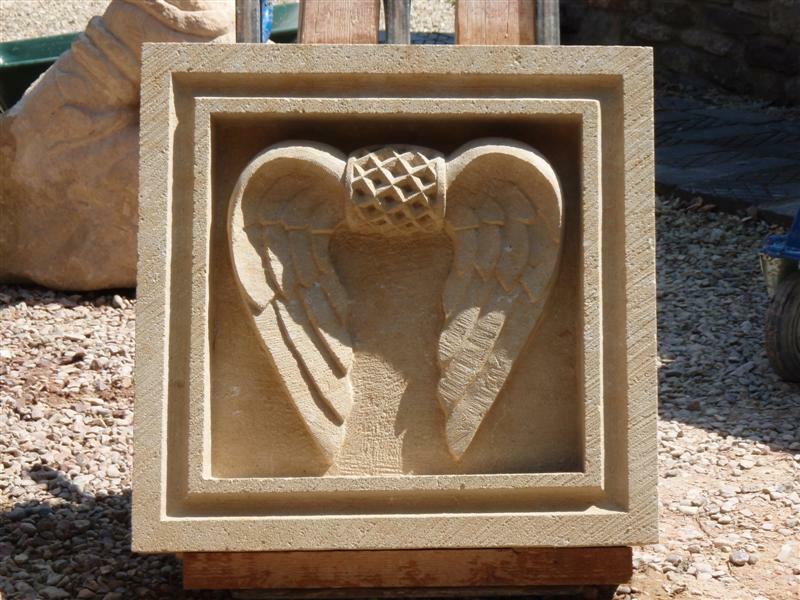 While I am running the festivals I am also running my business and in May 2014 I was given the opportunity to move into what used to be the back of the old pottery-I jumped at the chance as this enabled me to expand my business, my shop area is larger and so my stone carvings for sale have increased. I am able to have a permanent set up for have a go at stone carving which takes place in the school holidays. I am currently working on a large sculpture for a garden and I have a 3ft bear to carve for Sept 2016. I continue to carve house names and numbers which have been the staple of my business but I also get commissioned to carve all manner of things, I undertakes a few animal commissions a year which are incredibly taxing as the have to be like for like carvings. I love to design and carve sculptures and gifts for sale in my shop and just a few years ago I taught myself to silver solder and now make pendants and earrings. I am proud to say that through it all I have only sold what I have made and this will continue. I can design, sculptures and letters memorials and creatures. 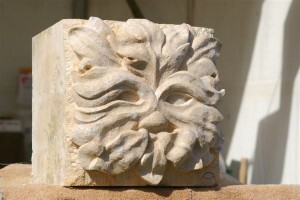 I love to be able to source my stone from local quarries but I am hoping to be able to carve some Italian marble in the not too distant future. Often you will find that there is an Art Nouveau feel about my sculptures, this is the elegant and flowing forms that I love to create and to be able to make stone look like it is light and delicate is a feat in itself. My ideas are forever evolving and I have no one source of inspiration-historical artists and sculptors are a source of knowledge for me I can look at the carving or modelled and cast bronze and figure out how it has been done. In May 2015 just after my most recent stonemason festival I was nominated to become a Yeoman mason, by the then Upper warden Bill Gloyn and I went up to London in October to receive my certificate. So the next 10yrs in business looks set to be amazing and if you would like to join me to celebrate I will have wine and cake at my workshop at Taurus Crafts on Sunday 22nd November. I would like to thank everyone who has contributed, bought and supported me over the last 10yrs, most importantly my boyfriend Ed Francis.